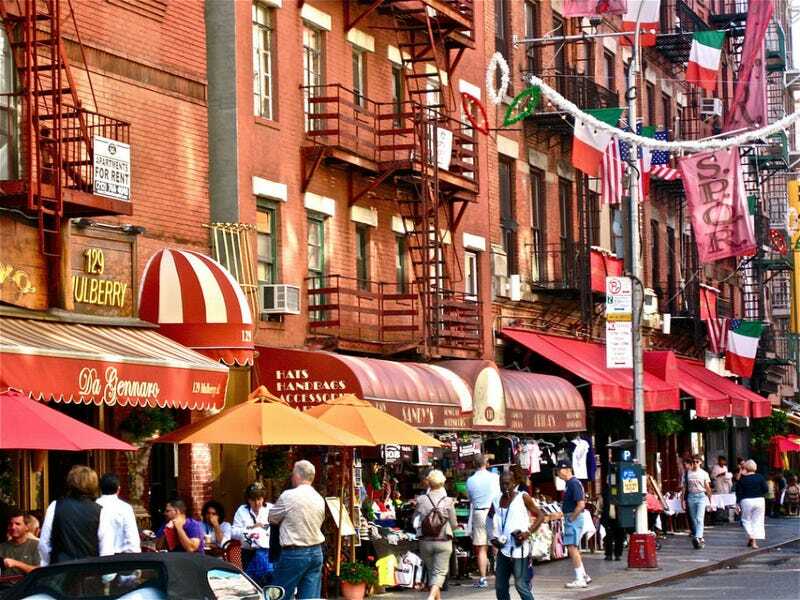 Welcome to the new New York: the Italian American Museum, located in what's left of Little Italy, is evicting an 85-year-old Italian-American grandmother surviving on food stamps and Social Security who lives in a building they own. Adele Sarno has lived in her two-bedroom apartment since the 1960s and would like to be allowed to die there; the museum would like a tenant who can pay $3,500 in rent. Little Italy is largely gone now, subsumed into Chinatown; what remains is basically one street of tacky restaurants and a dwindling number of Italian-American senior citizens like Sarno. Local news site DNAInfo reports that the Italian American Museum, which says it is "dedicated to the struggles of Italian Americans and their achievements," first began trying to evict her in 2010. After years of litigation, they won an eviction order in November; Sarno is supposed to be out by April 6, although she is appealing that decision. Sarno's father was born in Naples, and Sarno herself grew up in Little Italy; the New York Times reports that in 1945 she was crowned queen of the Feast of San Gennaro, a celebrated religious festival that survives today. She moved to her current apartment in the 1960s after divorcing her husband and lived there with her parents until they died. She lives with a 19-year-old cat named Tosha; her neighbors told the Times she's largely independent and in the habit of waking up in the middle of the night to cook pasta. She tells the paper that her friends have all died: "I've got my television." Sarno, who pays $820 a month in rent, mistakenly believed her apartment was rent-controlled, until a notice suddenly arrived five years ago telling her the rent was being raised to $3,500. Sarno survives on Social Security, help from relatives and food stamps and can't possibly pay that amount. The Italian American Museum told DNAInfo they plan to expand the museum; they told the Times they rely on the rental income and besides, as a spokesman put it, they shouldn't be "running a charity." Joseph Scelsa, the founder and director of the museum, also told the newspaper there aren't that many Italian Americans left in the neighborhood anyway, and that the museum is important because it provides "a legacy" to replace the actual Italian Americans who are dying off or moving away, or, you know, being forced out of their homes by rapacious and irony-proof landlords. Sarno will probably be forced to move in with her daughter in Wisconsin if the eviction is successful. She politely told DNAInfo that the state is "beautiful, but not for me. I'm a New Yorker." Her next court date is April 2.